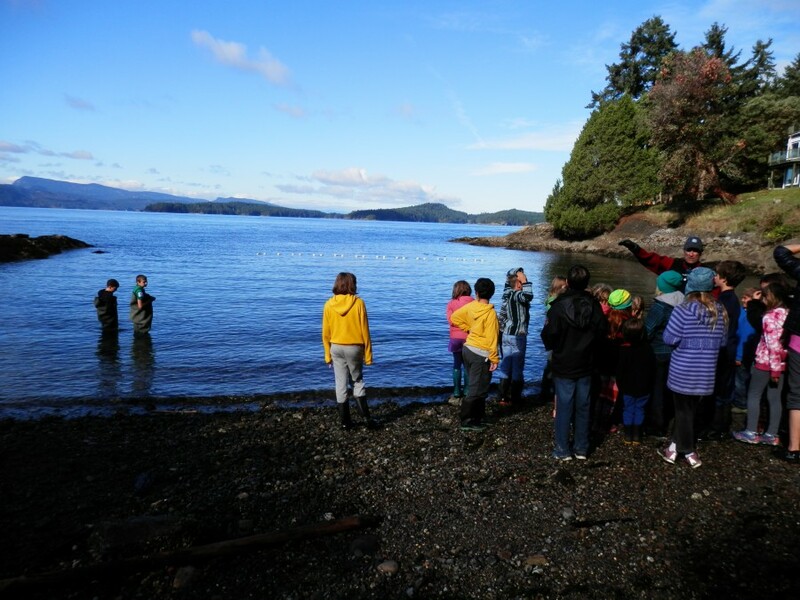 Our beautiful fall weather has offered some amazing days for outdoor explorations, especially at the beach! As a snorkeler, I am always interested in finding out what is going on at different times of the year below the surface of the ocean. Fish, however, are elusive, fast moving, and hard to identify as they scoot among the seaweeds. 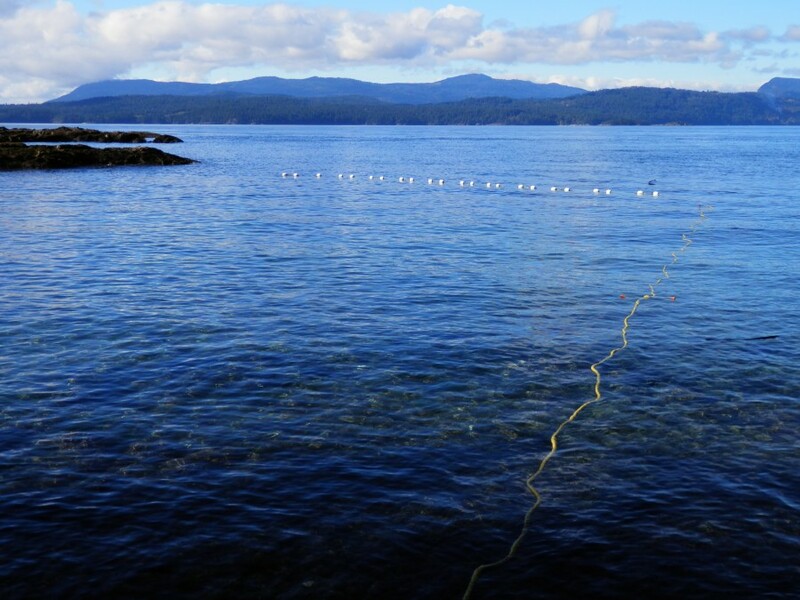 So I was very happy to witness the workings of a beach seine collecting an array of fish that live in the nursery habitat of eel grass beds in the sheltered bays of the Gulf Islands. Marine Biologists Doug and Jennifer Swanston came over from Vancouver for the day. 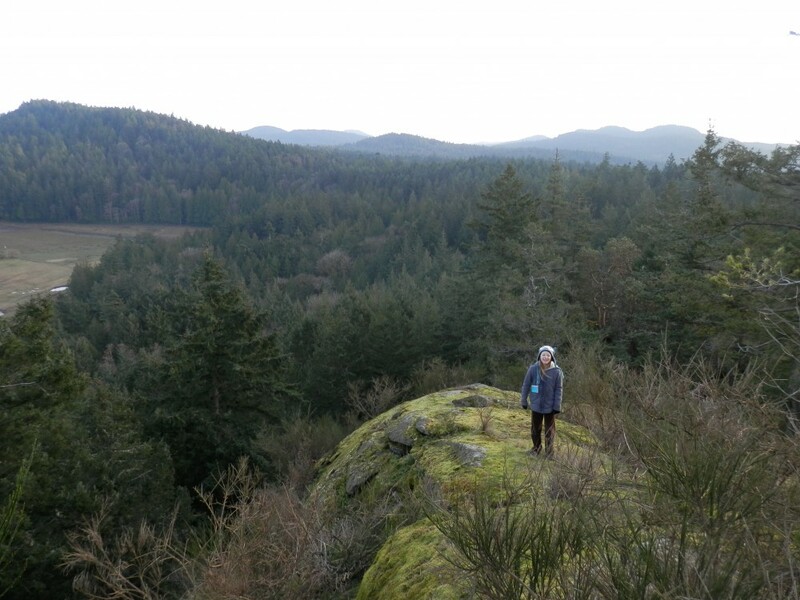 Jennifer has worked as a naturalist/interpreter for several groups, and has a BSc from UBC. 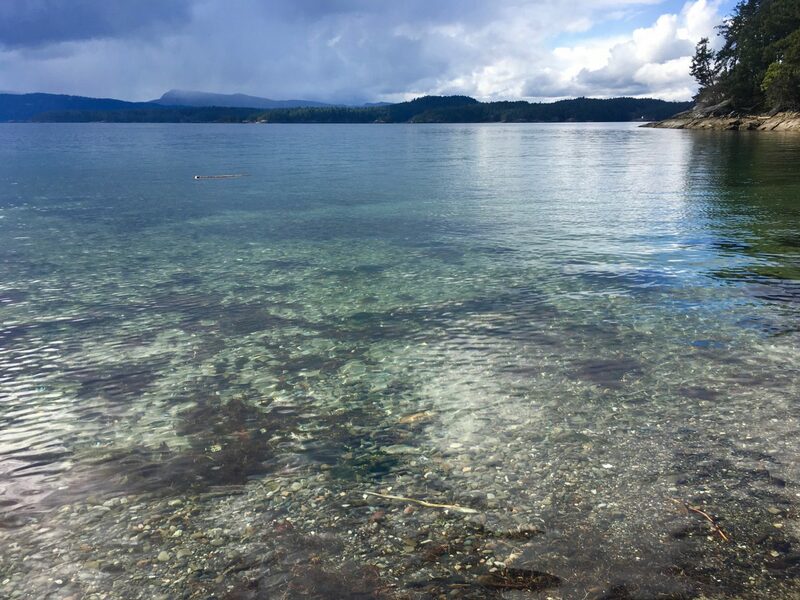 Doug Swanston has been working in the field of marine biology since the early 1980s, after graduating with his BSc from UBC. He is involved in research as well as education. A seine is a fishing net that hangs vertically in the water with its bottom edge held down by weights and its top edge buoyed by floats. Seine nets can be deployed from the shore as a beach seine, or from a boat. Seine nets have been used widely in the past, all around the globe since the stone age. Pre-European Maori deployed 1,000 meter long seine nets woven from green flax, with stone weights and light wood or gourd floats, and could require hundreds of men to haul. American Native Indians on the Columbia River wove seine nets from spruce root fibers or wild grass, again using stones as weights. For floats they used sticks made of cedar which moved in a way which frightened the fish and helped keep them together. Seine nets are also well documented in ancient cultures in the Mediterranean region, appearing in Egyptian tomb paintings from 3000 BC. They are still in use today for fishing, but they also enable marine biologists to carefully collect samples of fish and other specimens for research, allowing them to be released with little disturbance. 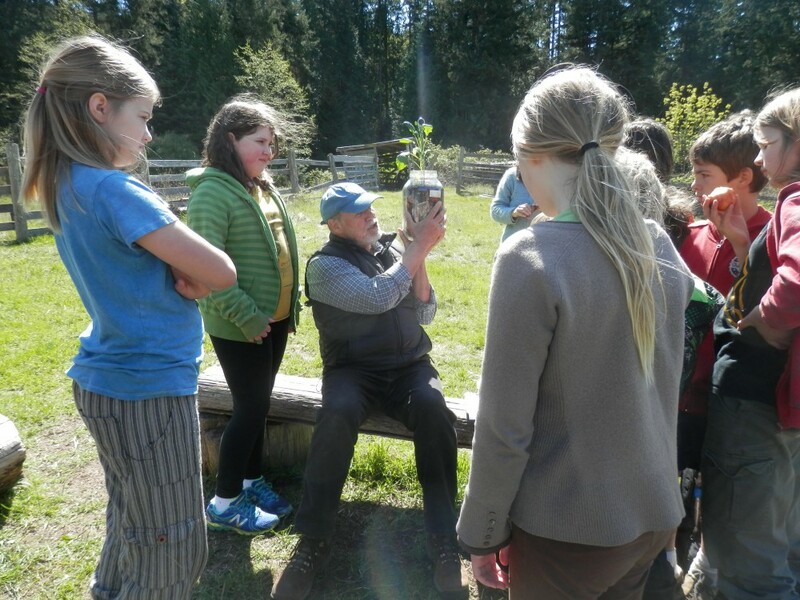 Doug and Jennifer were working with a group of 24 children, from grades 4-8, who are a part of the Pender Ecological Education Community. Doug began the day with some discussion of taxonomy and habitats; the classifications of seaweeds and grasses and the role that the different types have for different fish during the year. 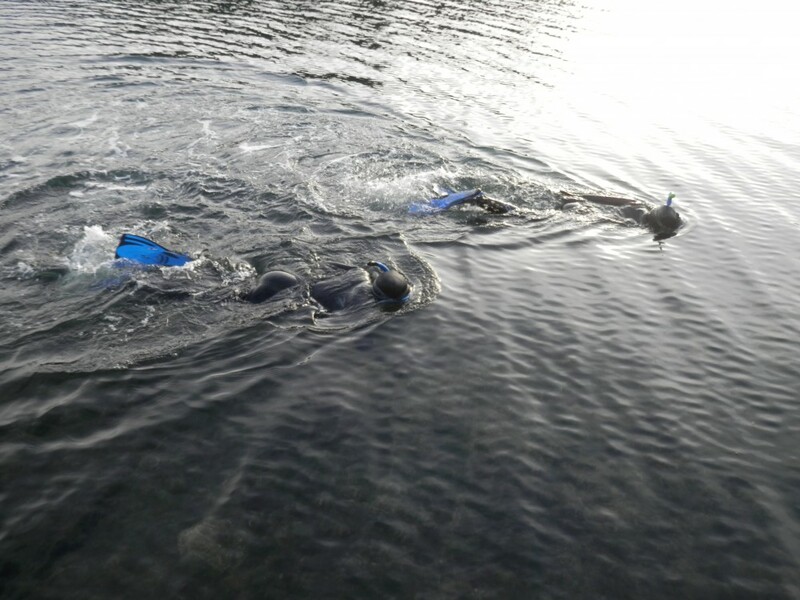 The nursery habitats of the eel grass areas have been previously mapped, with help from the Seagrass Conservation Working Group, and are especially worth observing for fish populations throughout the year. I have seen many types of small schools of fish while snorkeling, and the shallow, warmer waters protected by tall forests of the grasses with areas of sandy sea floors seem like the perfect place to hide and feed in relative safety from larger prey. 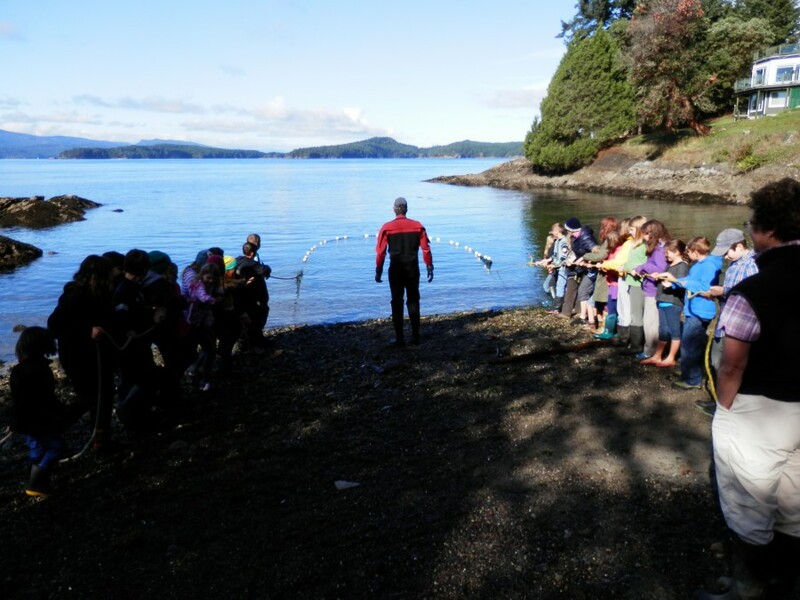 Once the net was pulled up closer to shore, the kids were encouraged to make an estimate of the number of fish rounded up. Each child had a bucket with fresh sea water in it, and when the time came for Doug to really haul the net up, they each had the chance to scoop a fish for their own observations. At this point, everyone was so excited- pointing and exclaiming and talking all at once, with questions and answers flying. Silver and orange fish flashed in the vibrant green, while purple crabs clambered about and unknown creatures slithered. Collected fish were named, shown, given seaweed to hide in, talked about, questioned, and eventually accompanied each student for a quick lunch break. 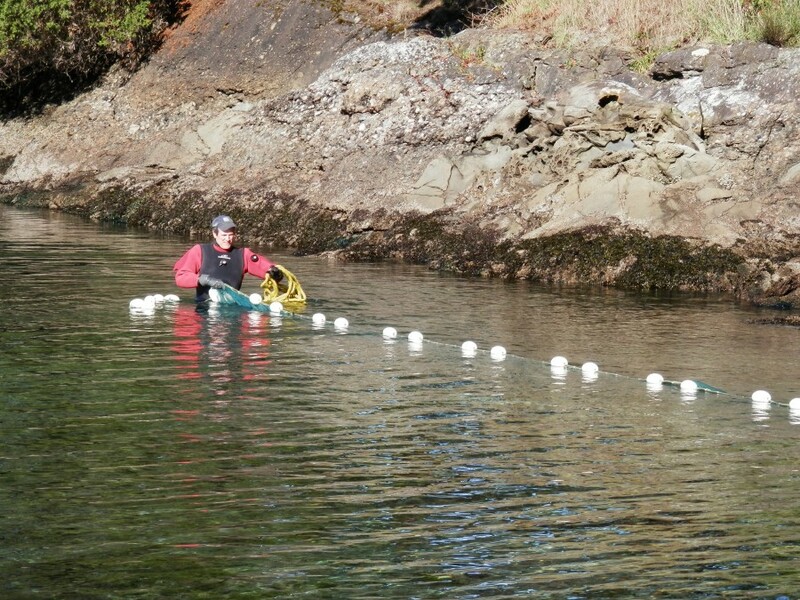 Doug was clear that the buckets had to be in a shady spot, and no hands were to be continually placed in the water, so the temperature doesn’t warm up. Adequate oxygen levels needed to be considered, so a particularly large Whitespot Greenling was placed in a larger cooler of water. It turned out to be a female carrying a belly full of eggs. Doug went through the collected fish and made notes of what was found, as well as identifying to the group interesting facts about specific specimens. Of particular interest was the bay pipefish, our local variety of sea horse, which depends on the eel grass beds entirely. We also found a pen point gunnel, with beautiful eye stripes and a colour to match the eel grass itself. There were lots of threespine sicklebacks, striped seaperch, pile perch, kelp perch, shiner perch, and tubesnouts, which congregate in large schools. Doug estimated over a hundred fish were in the net, and as he pulled the net gently back out into the water to release them, he seemed quite excited that so much life was present and healthy in our local waters. For many years, I have had the idea to eventually raise angora rabbits as part of our family and farm. I imagined that I would wait until all our building projects were done, when I might have more space in my time to learn and manage another project. 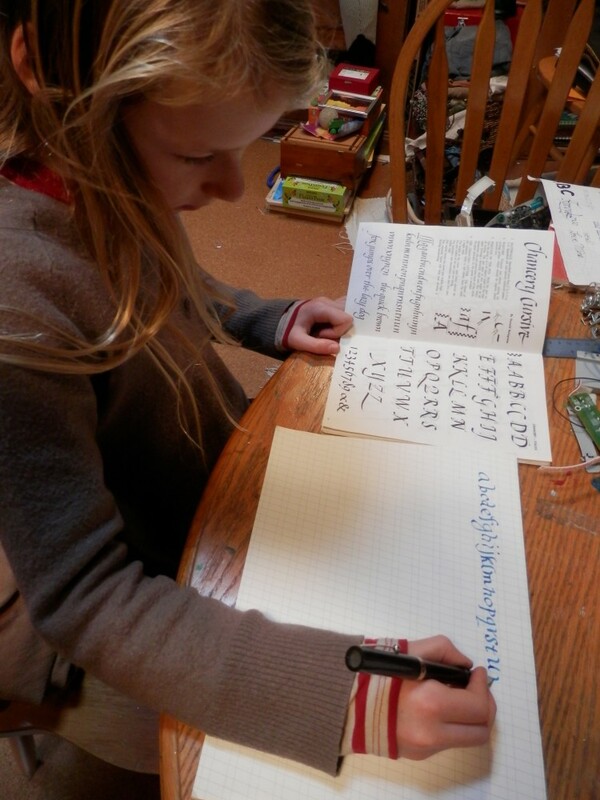 However, it seemed evident that our home schooling journey needed more long term and interactive projects, and I realized that the things I wanted to do were also things that my kids were interested in, and besides, home schooling for us is all about living, creating, and doing- just learning through life. So I promptly gave my twelve year old daughter the task of taking on some research to find out what we need to know and do, and where to acquire some rabbits. In her process, she herself fell in love with the possibilities of these cozy cute creatures, and began to be a major motivation to our moving forwards. We decided to find some French Angora rabbits, since that seemed to be the breed that was an easier level of management for first time bunny owners. They have a clear face, free of long hair, and a thick coat of soft hair that doesn’t tangle as quickly as some other breeds. 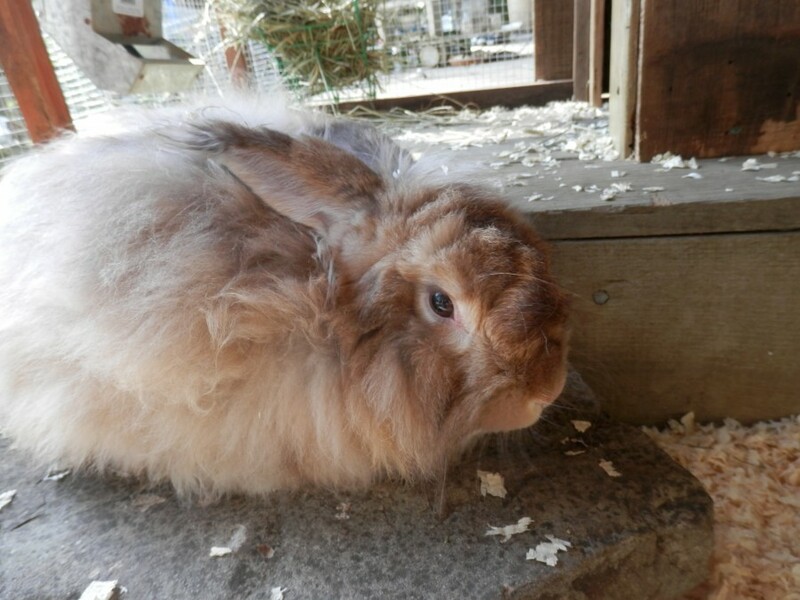 We weren’t too keen on the rabbits that had a face hidden behind so much hair! Their fibre can be gently pulled off their bodies every 3 months, when the new undercoat grows in, so no shearing required. We looked at a space to give them, the food they needed, the protection they needed, and the management of their poop. We also found that they are hypo-allergenic, which was just what we needed, since my mother with whom we live is seriously allergic to cats. French angora’s seemed to be a lovely pet, (they generally have a good temperament and are playful and clean), they can live outside, (great for our small space), they produce beautiful fibre for all my weaving and spinning projects, and we obtain a constant supply of rich rabbit manure that can be applied fresh right to the garden. 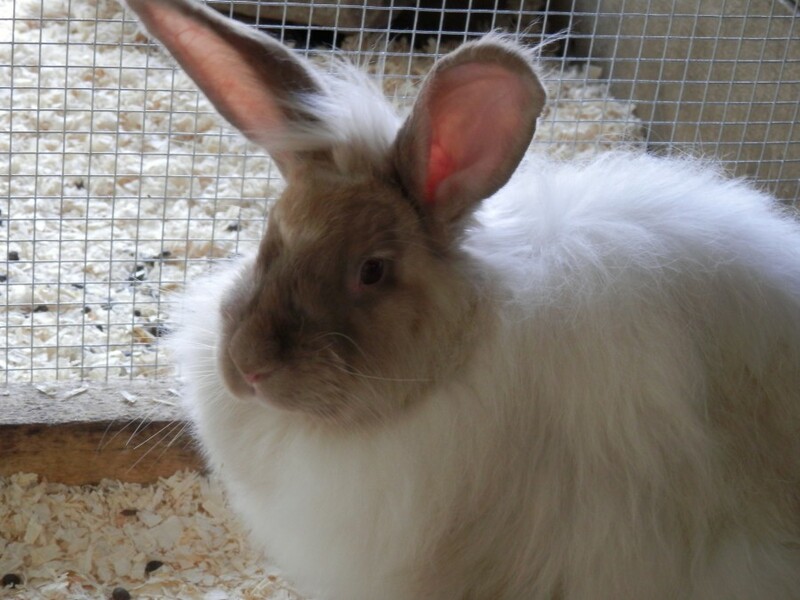 We didn’t find any breeders in our area, or even distant area, but we did find an owner who was no longer able to look after her two french angora’s, and one french/satin x. The two french’s, one male and one female, both young, are a breeding pair so we can grow our numbers if we like. The other is an older male who has a beautiful, finer coat, and was the last one she was left with. We decided to take them all. They are all pedigree. 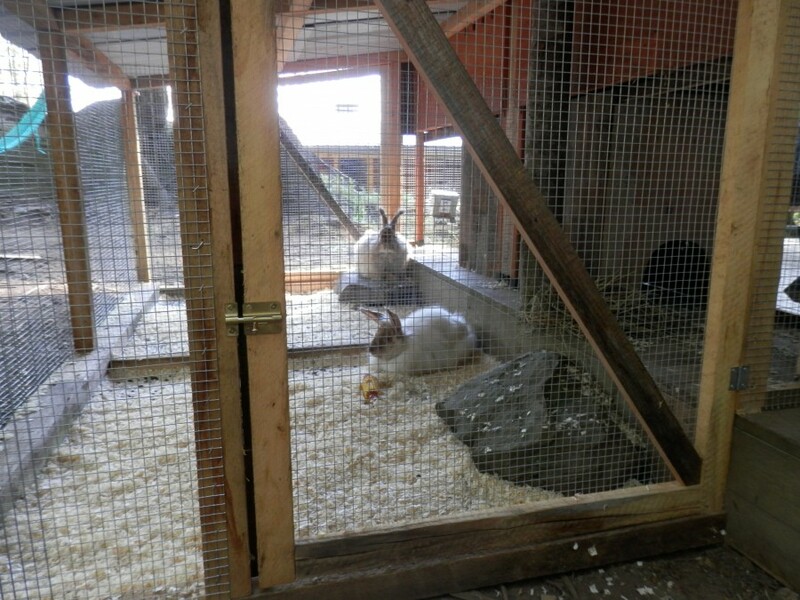 There was a lot of different types of housing offered for rabbits. 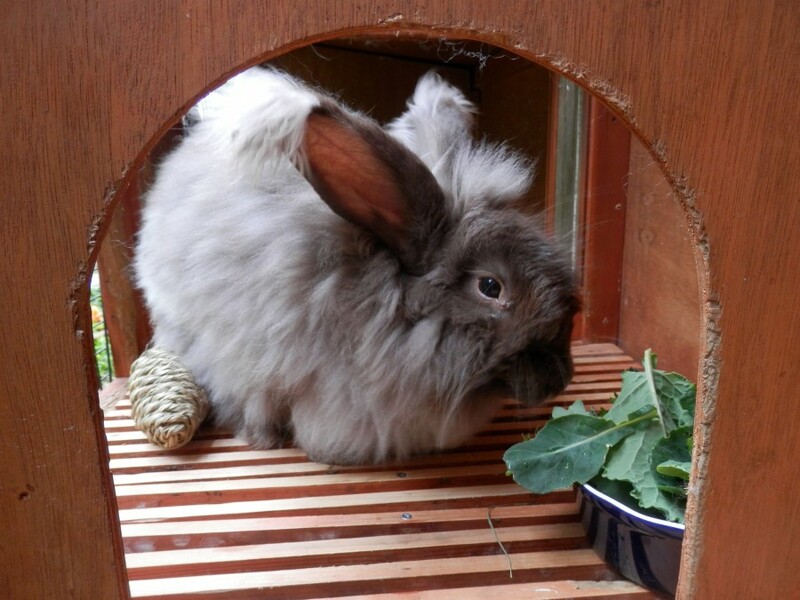 We were given a double long wooden hutch, so we started with that for Gustav, the young french angora male. We built a 6 foot square enclosure for him to run around in when we are out in the yard with him. I haven’t seen any signs that he might want to dig his way out. It is shaded and covered from over head predators. We added two enclosures underneath the wooden one, on the deck of our old trailer, which both open to two separate 4 foot square runs, with wire floors and a roof to keep the area dry and shaded. We supplied a litter tray with a drop pan underneath, which they seem to be using after we placed them in the corners that the bunnies had decided were their bathroom areas. Gustav’s hutch came with slatted floors and drop pans, which are so easy to empty and keep clean. We have already collected quite a bit of fibre from them. It has taken a few times of grooming to get them used to us, but mostly they have all been very patient while we brush and pluck and generally pick through their fibre, checking for any bugs, tangles, cuts or signs of needed care. The previous owner of these rabbits generously supplied me with many books to read through, and I read that observation and time with the bunnies is the best way to know what they need. 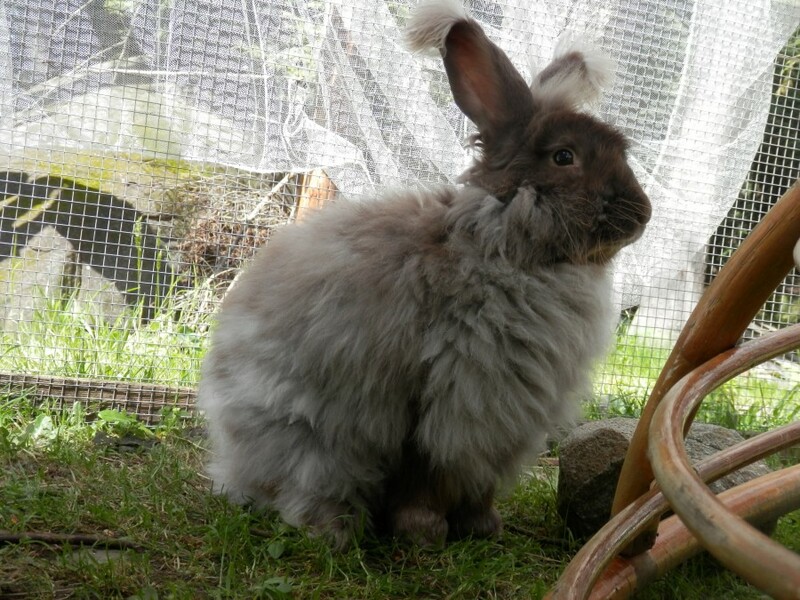 (The Nervous New Owner’s Guide To Angora Rabbits, by Suzie Sugrue was the best!) Between myself, my husband, my mother, and my two kids, we are constantly looking to see how they are doing and if they are happy. My daughter goes to feed them as soon as she gets up in the morning, and we brush each of them in rotation every few days, and clean out their living areas thoroughly once a week, with daily litter pan emptying. We feed them some greens and vegetables everyday, with a constant supply of timothy hay that is locally grown on the Saanich Peninsula. They eat pellets, and a small amount of dried papaya to help their stomachs digest any of the long hair they swallow while grooming themselves. All of this doesn’t take too long, but it certainly is a reminder of the commitment to have small creatures in our care. It has been wonderful to witness the connections that the kids have made with the rabbits, and the level of responsibility that they have shown to keeping them healthy and loved. My daughter put together a presentation for our home schooling group on angora rabbits. I have yet to spin any of the fibre, but as I have collected it, I have been dreaming of the the super soft and warm scarves, hats, or shawls it could become. Every thing happens in it’s own time, and eventually I will understand the inticacies of the art of using the fibre, just as I am beginning to understand the procedures of care for our new family fluff balls! Forest school is a type of outdoor education in which children (or adults) visit forests/woodlands, learning personal, social and technical skills. 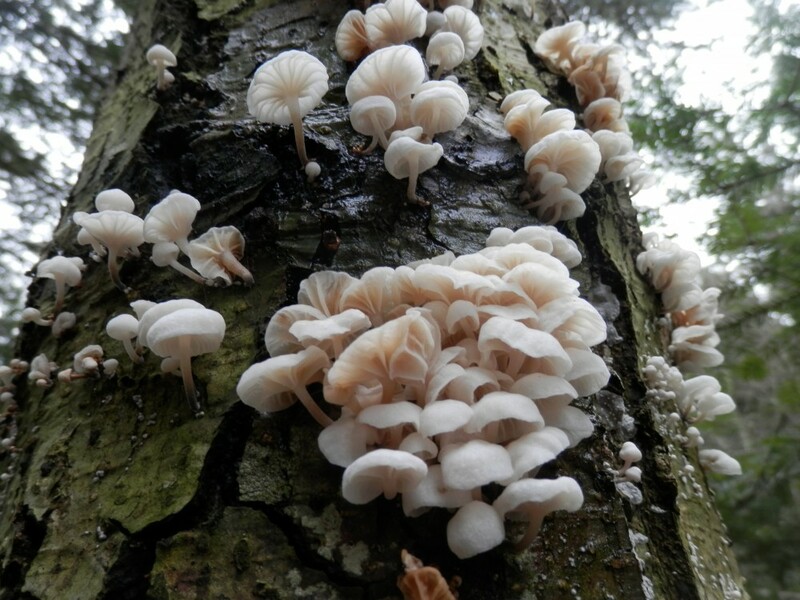 It has been defined as “an inspirational process that offers children, young people and adults regular opportunities to achieve and develop confidence through hands-on learning in a woodland environment”. 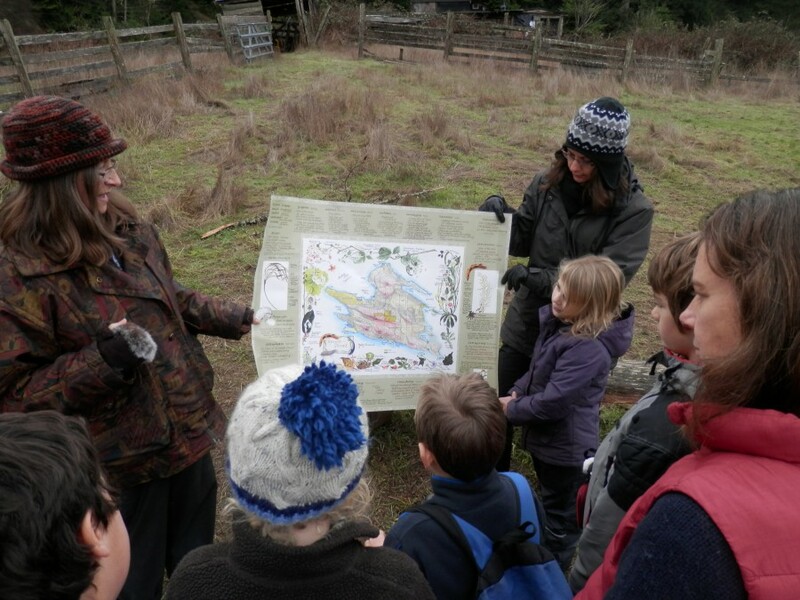 Forest school is both a pedagogy and a physical entity, with the use often being interchanged. Forest school uses the woods and forests as a means to build independence and self-esteem in children and young adults. 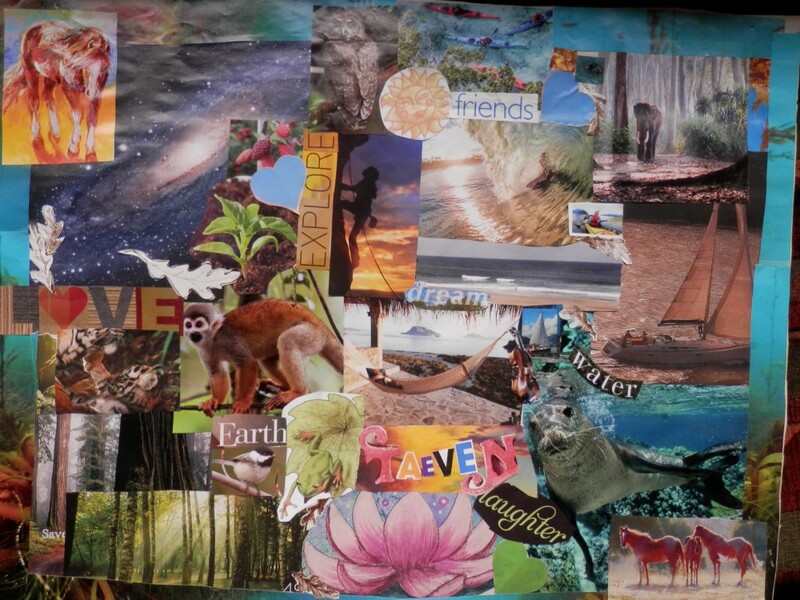 Topics are cross-curriculum (broad in subject) including the natural environment, for example the role of trees in society, the complex ecosystem supported by a wilderness, and recognition of specific plants and animals. However, the personal skills are considered highly valuable, such as teamwork and problem solving. The woodland environment may be used to learn about more abstract concepts such as mathematics and communication. Forest school provision is also called nature schools. In Denmark it became an embedded part of the curriculum for pre-school children (under seven years) stemming from their småbørnspædagogik, or ‘Early childhood education’. Children attending Forest kindergartens were arriving at school with strong social skills, the ability to work in groups effectively, and generally children had high self-esteem and confidence in their own capabilities. In 1957, a Swedish man, Goesta Frohm, created the “Skogsmulle” concept to promote learning about nature, water, mountains and pollution. With an increasing focus on measurable outcomes, forest schools have gained acceptance as an educational method in their own right. Beyond primary school age children, forest school is frequently used to further develop social skills and explore creative learning and focuses on developing firm foundations for continued personal and education development. Our vision is for all Canadian children to play and learn in local forests, creeks, meadows, prairie grasses, mountains, and shorelines with a wise and skilled educator who understands the power of play and child-directed learning and how this can contribute to a more sustainable world. 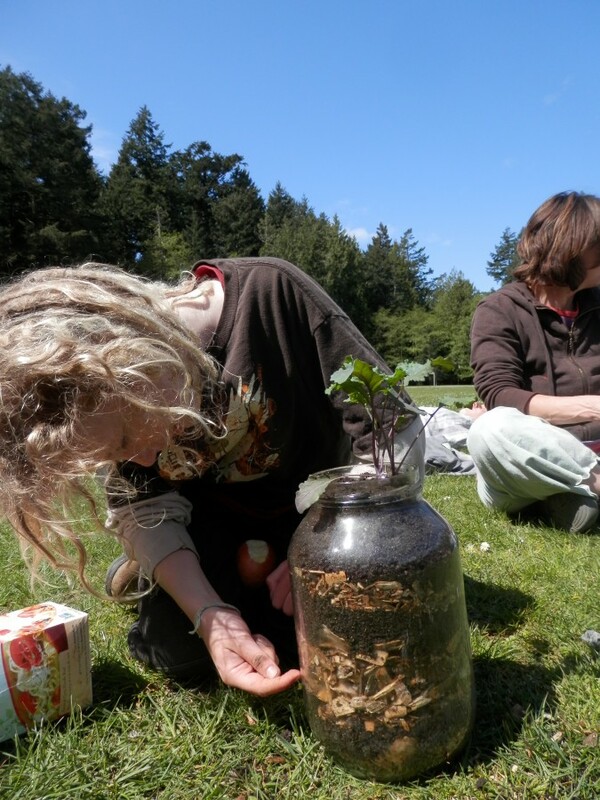 Forest School Canada runs a practitioner’s course in conjunction with the the UK Forest School Association. 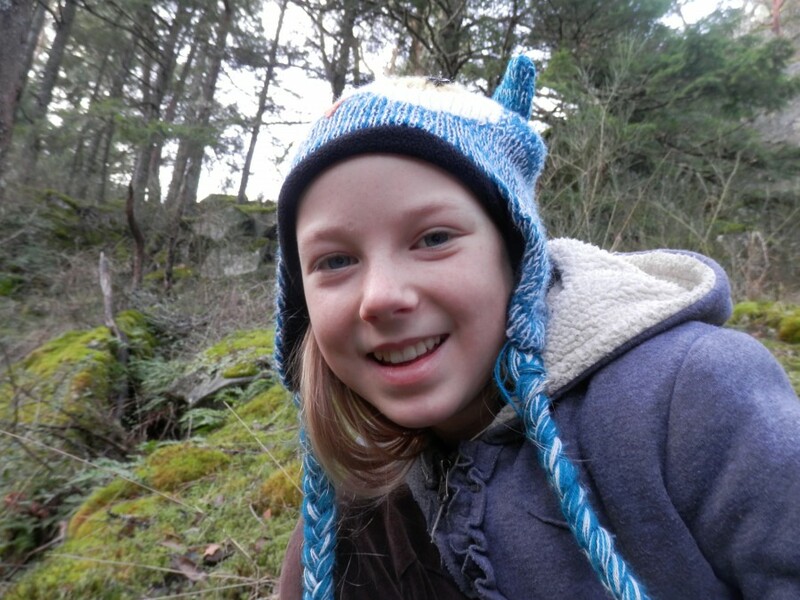 The course is “a program steeped in the tradition of Forest School abroad, but grounded in the realities of the Canadian experience.” Julie Johnston, our Spring Leaves resource teacher and facilitator attended their July 2014 program held at UVic — a wonderful week of outdoor learning about how to engage children in outdoor learning. They focused on risk assessment and management, practical outdoor skills (fire building, tool making and safety, flora and fauna identification), woodland management, the theories of holistic learning and development, and the establishment and delivery of a Forest and Nature School program. Our Spring Leaves Forest School is a blend of Forest School ethos with the themes in Coyote’s Guide to Connecting with Nature, which is a book about the principles, games and other activities in Coyote Mentoring, a program and “way of learning” based on Tom Brown Jr’s Tracking School and Jon Young’s Wilderness Awareness School. 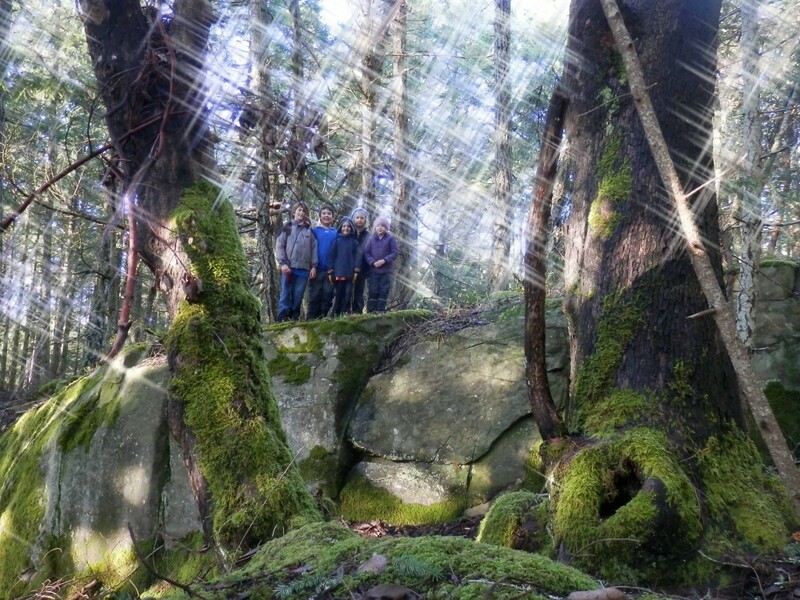 Julie’s background in outdoor and experiential education and the combination of these two programs has created a wonderful foundation in which our group can explore the needs of our large span of ages (preschool to 13, plus adults!). We have had three weeks of our forest school so far. 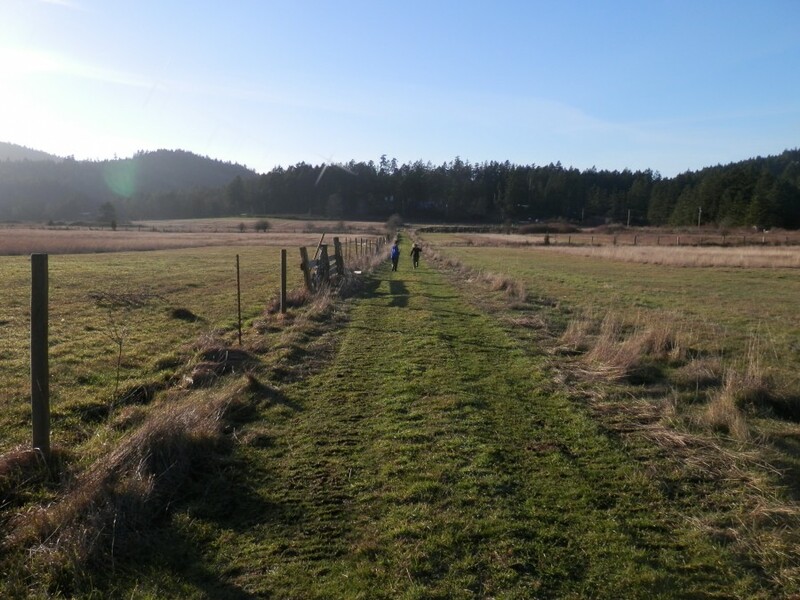 Each week we have left our cars and made the 5 minute walk through agricultural fields and up to a place with a fire pit surrounded by bench seats. We have a circle, where we each have the chance to say how we are doing, feeling, or what we are grateful for. Julie introduces the theme of the day, and offers an activity or game that gets us involved in the theme. We have spent time practicing our owl eyes, deer ears, and fox walking, and considered what around us we can catch, gather, eat, climb and tend. We have made ourselves aware of potential hazards of the area, and made sure everyone understands what to do in case of getting lost. 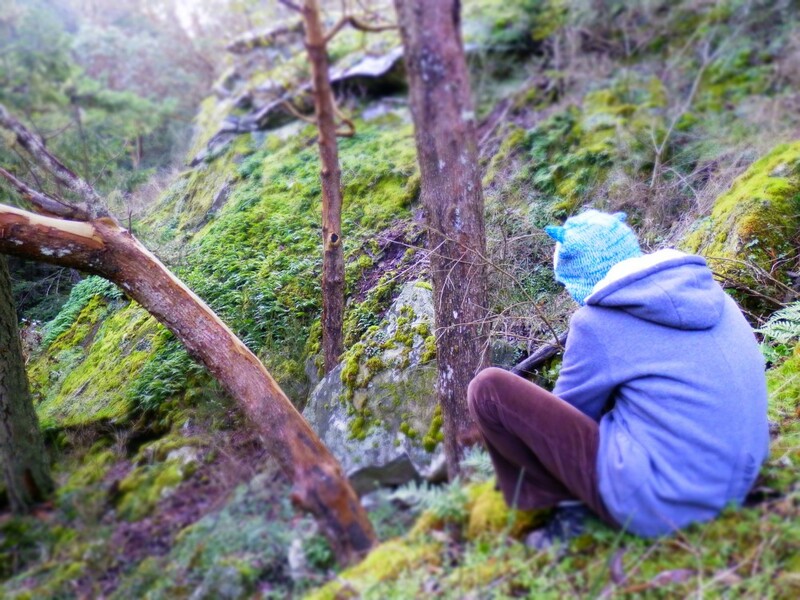 We did some tracking and observing of landmark features, and we spend some time in our own quiet meditative sit spot. We also have a growing list of fun games to play. In nature we find peace, reflection, micro systems, macro systems, observation, exploration, growth patterns, elemental effects, cascade of reaction, challenges, physical movement, high intake of fresh oxygen, moving up and down, scrambling, reaching, walking carefully, stillness, problem solving, understanding safety, being closer to the reality of survival, understanding comfort, help from others, learning skills and then doing them, leading others, helping others, asking questions, seeing our effectiveness or consequences, fun, playing games, imagination, diversity, seasonal cycles, life cycles, beauty, creativity, symbiotic relationships, healing, spiritual connections~ mind, body, spirit. I am sure this list could be plenty longer. I am also sure that some things on this list are attained in other ways. This is what I experience, and what I see my children experience when they are outside. Over many years together as a changing group of home schoolers, other parents also agree that basically, being outside together seems to be the most satisfying and uplifting scenario, for the kids and for the adults. Finding that this type of “education” is recognized as being consistent with Attention Restoration Theory, where children taking part in forest school have been described as more relaxed, is not surprising. Relationships between the children and each other, with adults, and with the environment, are important. 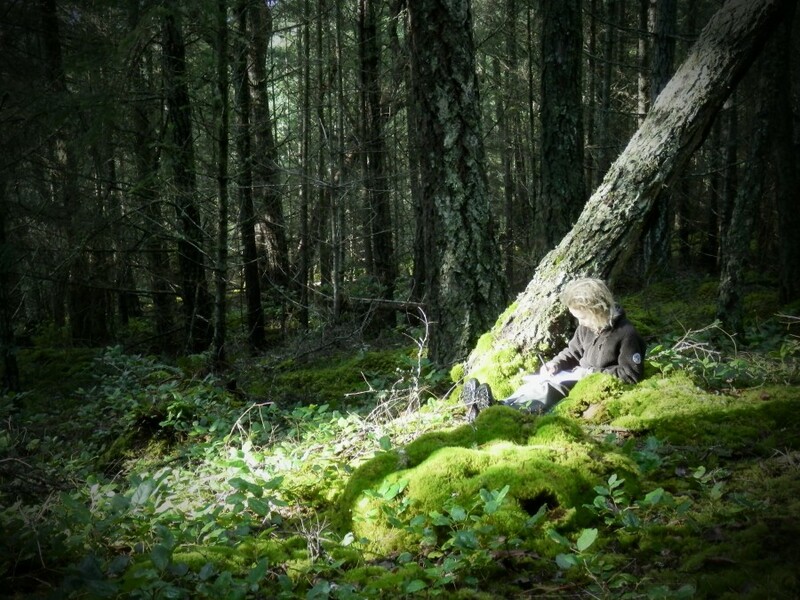 Forest schools have been found to help children with additional support needs, including Attention-deficit hyperactivity disorder and autistic children. The Biophilia hypothesis argues that a love of nature is instinctive. The term ‘nature deficit disorder’, coined by Richard Louv in his 2005 book Last Child in the Woods, recognizes the erosion of this by the urbanization of human society. 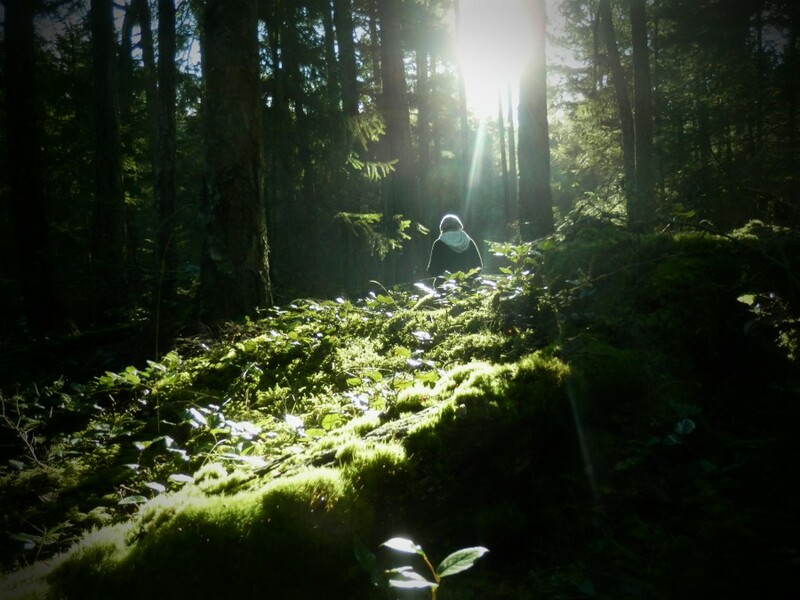 Forest Schools are being created all over the globe, with classes filling to capacities. It is no surprise that we recognize the need for such educational reform, especially in the early years, but also as we grow. 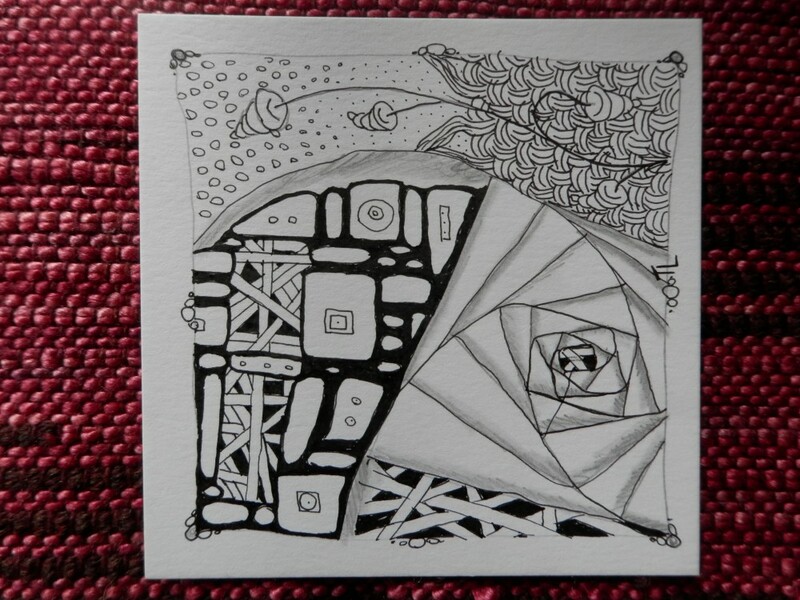 There is a Hopi word, koyaanisqatsi, which means life out of balance, or a state of life that calls for another way of living. The way we bring our next generations into the world is a vital part of all systems that we as humans need to change to bring ourselves back into balance. 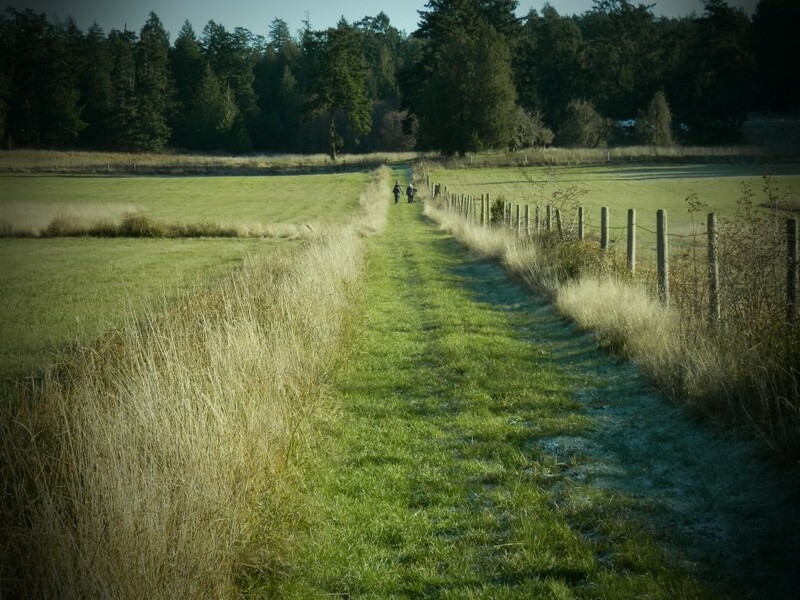 Deep thanks to the family of the Valley Home Farm for opening their beautiful land to us. 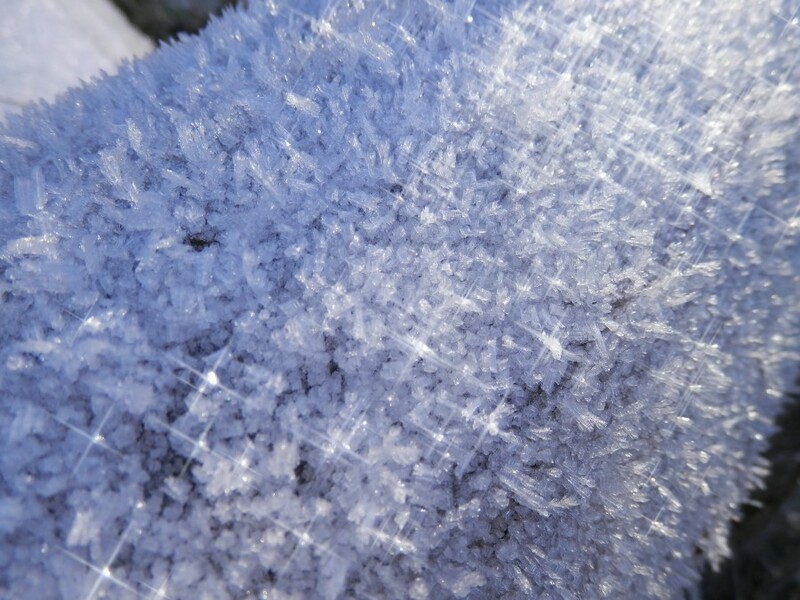 Getting outside during the winter for extended periods of time with the kids can sometimes be challenging- even in what I consider to be a fairly moderate climate comparatively to the rest of our country. Rainy days can seem dreary, and clear days can feel surprising frozen on our noses and toes, unless movement is constant. In this past clear, cold spell of weather, myself and a few families were invited to spend an afternoon at a farm, lighting a fire together and cooking some food, as well as explore the surrounding forest and learning to make charcoal burned cedar spoons with a wonderful member of the community, Emily. Thanks so much to Roz and her family, who are in our community of homeschoolers, for organizing this day for everyone! First we went through the steps of lighting a fire without the use of paper. Emily brought some pieces of dry cedar, and the kids took turns using their knives to make a pile of cedar shavings that would be the fire starter. Then they split kindling from the cedar, and set that close by with other larger pieces of fire wood that were collected nearby. Our warm fire got going rather quickly, and we set a variety of foil wrapped veggies into the fire to get them cooking while the kids went with Emily to learn some compass skills in the forest. When they returned, the coals were good and hot and we opened the foil veggies. Roz brought a batch of bannock dough, which we wrapped around sticks and roasted in the fire. We discovered a large apple tree still loaded with apples, which turned out to be all rather frozen, but which baked up beautifully when one of the kids wrapped some bannock dough around the chopped frozen apples and put it in the fire inside some foil. It was the best campfire apple pie we had ever had! As we finished eating, Emily demonstrated how to make a cedar spoon by using pieces of charcoal to burn out the scoop. It needed lots of careful handling to maneuver a coal out of the fire and onto the flat end of a piece of cedar quickly enough so that once it was clamped in place with another piece of wood, the coal would still have a red ember when it was gently blown upon. Sometimes the coal would go out, and another one had to be picked out of the fire, or sometimes a rest for the blower was needed, and so another coal was exchanged. As the hole in the spoon got deeper, a smaller coal could be used to burn into the bottom of the scoop without adding anymore width. 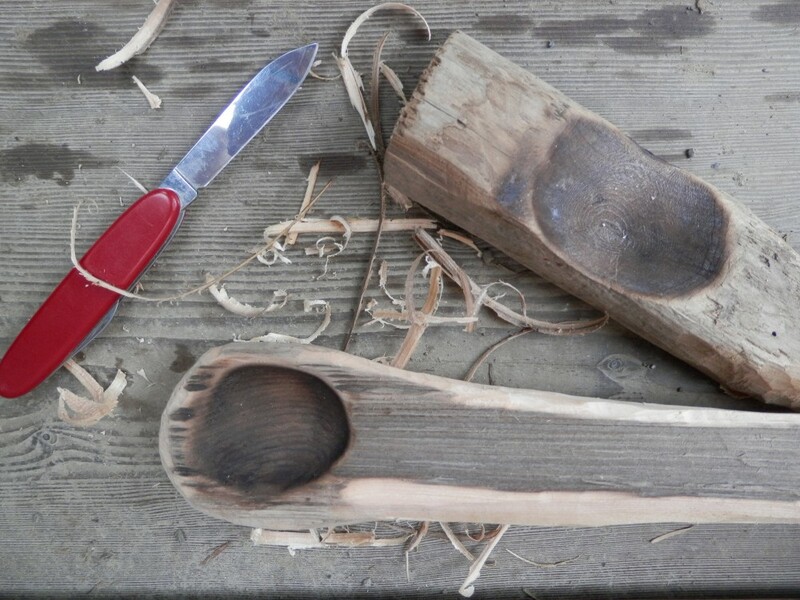 Once we got home, there was lots of whittling, carving and sanding to do to shape the rest of the spoon. It was soon evident that this was a very meditative and patient sort of process, with lots of deep breathing and focused attention on the glowing embers. Being in close proximity to the hot fire kept everyone warm, even as the crisp air refreshed our beings with so much oxygen. A few hours later, as I packed up our things and we put the fire out, I wandered back across the fields in a happy state of feeling connected to the land around me, to the group of kids and adults with me, and to myself in this place and time of life. Throughout so many ongoing fluctuations and shifts, this was a perfect afternoon to be reminded of such constant, simple, and important states of being that carry me along.